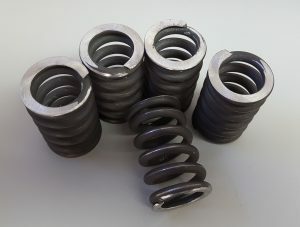 A perfect example of what we offer as a full-service spring design and manufacturer. We were contacted by a major nuclear generation facility carrying out service work during a routine maintenance shutdown. The customer had a requirement for some replacement springs which had failed in a critical valve system (no longer supported by the OEM). Turnaround times were very tight as the customer had only one week to get the valve back on-line. 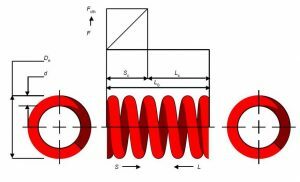 The customer sent us a sample of one of the collapsed springs (no drawing was available) and our Design Engineers immediately diagnosed the failure as an issue with the original specification of material for the working environment – chemical contact exposure. Using our spring design software our Engineers upgraded the material specification to Phynox which would deliver enhanced reliability and longevity in this working environment but still met the dimensional and spring rate specifications. The customer signed-off on the new spring design and our manufacturing team got to work on coiling, heat treating and grinding the springs. From the initial customer contact through design, manufacturing, inspection and shipment took just four days!